Earlier story: For Colbert Nation, the big day has finally arrived. Stephen Colbert will walk on stage as the new host of CBS's "Late Show" on Tuesday night, nine months after signing off from his satirical Comedy Central show, where he played the role of conservative pundit with an oversized opinion of himself. Fans of the comedian started lining up early Tuesday morning to be a part of Colbert's first taping -- which will take place at 5 p.m. at the Ed Sullivan Theater in midtown Manhattan. The actor George Clooney also arrived early -- around noon -- to participate in a pre-taped segment. Clooney will be one of Colbert's inaugural guests along with Republican presidential candidate Jeb Bush. CBS CEO Les Moonves was also spotted heading into the Ed Sullivan Theater before showtime. 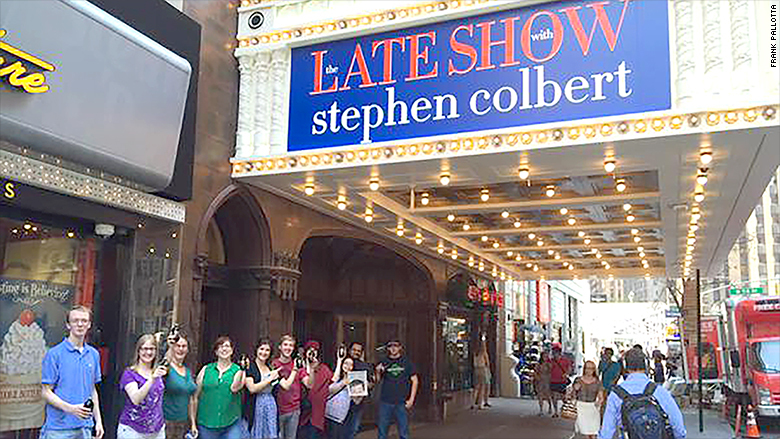 The younger demographic is visible in the line outside Colbert's theater. "So many people don't know who Stephen Colbert the person is," said Rose Frankel, 18, who was one of the first in line Tuesday morning. "We're finally going to get to see him tonight." Frankel said she thinks the "real" Colbert is a "sweet, funny guy" and has peeked through the persona he played on Comedy Central. The host himself has also spoken about embracing who he really is on the "Late Show." During Colbert's only national TV interview before the debut, the comedian told "CBS Sunday Morning" that he found it flattering that people believed his pompous character, but that now "it's really nice not to have to pretend it anymore." Some fans lined up for Colbert's new "Late Show" as early as 7 a.m.
Colbert's search for himself will also apparently extend to segments on his new gig. The host told Time magazine last month that the telecast will have "a planned series" called "Who Am Me?" 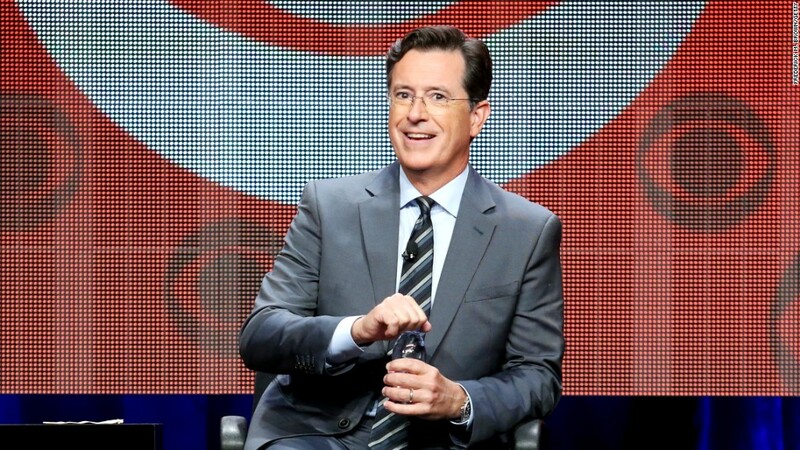 Colbert has been off TV since ending his "Colbert Report" in December. To get back into the swing of things, he has been holding test shows for weeks. One of Colbert's biggest competitors, "Tonight Show" host Jimmy Fallon, took to Twitter on Tuesday to wish the new "Late Show" host luck. To our friends at @colbertlateshow, congrats on your first show and hopefully dozens more. Break a finger. Ankur Butala and Jayne Zhang, both 31, drove from Baltimore overnight and waited from 7 a.m. to be the first in line for Colbert's premiere, calling it a "special occasion." They were also in the audience for Jon Stewart's farewell in August. "The last 'Daily Show' was incredibly bittersweet," Butala said. "I'd be amazed if Stephen can top that, especially since he was an integral moment of that as well." 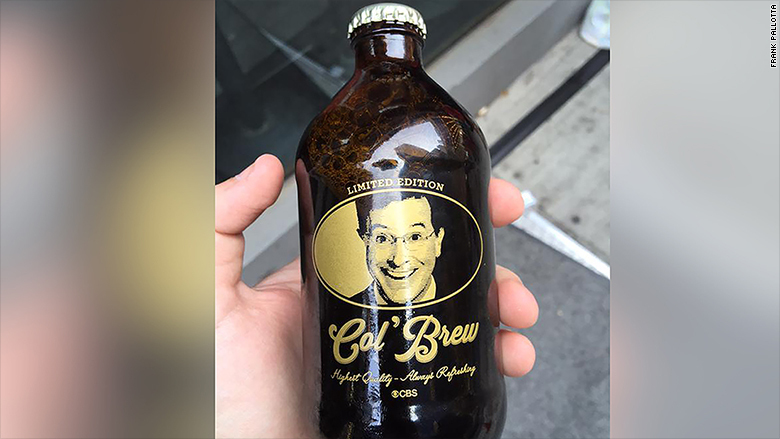 "Col' Brew" coffee were being given out to those outside the Ed Sullivan Theater on Tuesday. There was a carnival atmosphere outside the theater on Tuesday. Marketers handed out free bottles of Colbert-themed iced coffee and copies of the New York Daily News emblazoned with Colbert's face. And those lucky enough to get tickets to the first show received a hand stamp that resembled a cartoon version of the host's face before entering. Sharilyn Johnson, 36, predicted the new "Late Show," housed in a renovated theater and with a largely new staff behind the scenes, would feel like "an entirely different show" than Letterman's version. "The only thing that'll be the same is the first half of the title, the theater he's doing it in, and the network he's on," she said.